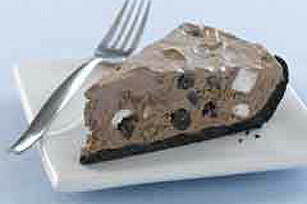 Our easy no-bake Rocky Road Ice Cream Shop Pie is everything you'd expect—and hope for. It's made with marshmallows, pecans and chocolate chunks. Pour milk into large bowl. Add dry pudding mix. Beat with wire whisk 2 min. or until well blended. Gently stir in whipped topping, marshmallows, pecans and chocolate chunks. Spoon into crust. Remove pie from freezer 15 min. before serving. Let stand at room temperature or place in refrigerator until pie can be cut easily. Store leftovers in freezer. Top with additional whipped topping just before serving.